Wasim Bux is product manager at the car insurance provider iGO4. Here, he talks us through some of the most common car insurance claims, and how you can avoid having to make them. As a new driver, it’s important that you know what the most common car insurance claims are, and what you can do to avoid having to make them. This will ensure that, every time you hit the road, you’re aware of the most prevalent dangers, and know how to keep you and your passengers safe, as well as preventing your car from getting damaged. Here, I’ll talk you through five of the most common claims drivers make and explain how you can avoid making them. Read on to learn more. Rear-end collisions are one of the most common types of accidents on the road, but they’re also one of the easiest to avoid. Although weather and road conditions are sometimes to blame, most rear-end accidents are caused by drivers following the vehicle in front of them too closely, or not paying enough attention to the road. To avoid falling victim to a rear-end collision, you should ensure that your brake lights are always working perfectly, so drivers behind you are aware of when you’re slowing down or stopping. You should also pay careful attention to your rear-view mirrors, so you always know what’s happening around you, and keep an eye out for careless or aggressive drivers. If you do feel threatened by someone in another vehicle, it’s best to move away from them as soon as you safely can. To avoid crashing into the back of another car when you’re on the road, leave plenty of space between you and the vehicle in front. A good gauge is the 2 second rule, which involves choosing a marker — maybe a bridge or a sign — and checking that there is two seconds between the car in front of you and your vehicle passing your chosen point. When the roads are wet, it’s best to double this to four seconds. It’s easy to think that windshield damage is unavoidable — you can’t force stones to stay planted on the road, after all. However, there are some steps you can take to prevent some of the most common situations where windscreen damage occurs. Most windshield damage is caused by rocks and grit falling from the back of large trucks so, if possible, it’s best to keep your distance from vehicles that are likely to cause you problems. When you’re travelling on roads that feel particularly uneven, or that have recently been gritted, then it’s wise to reduce your speed. This will help to prevent your tyres from throwing up debris that could damage your windscreen. Parked cars are quite frequently damaged by other drivers and, while you can’t always prevent your vehicle from being hit while it’s unsupervised, there are some things you can do to reduce your chances of falling victim to a hit and run. For example, sometimes it’s better to park further away from a shopping centre, supermarket, or entertainment venue. While this will mean you need to do a bit more walking, it will help you to avoid what are likely to be the high traffic areas and, in turn, this should reduce the risk of your car being scratched or dented by another vehicle. This might seem obvious, but it’s vital that you always park inside the white lines of a parking space. You should also try to leave plenty of room either side. Additionally, if you’re driving into a space near cars that are already parked, you should leave them plenty of room, so the driver and potential passengers can easily open their doors without hitting your vehicle. 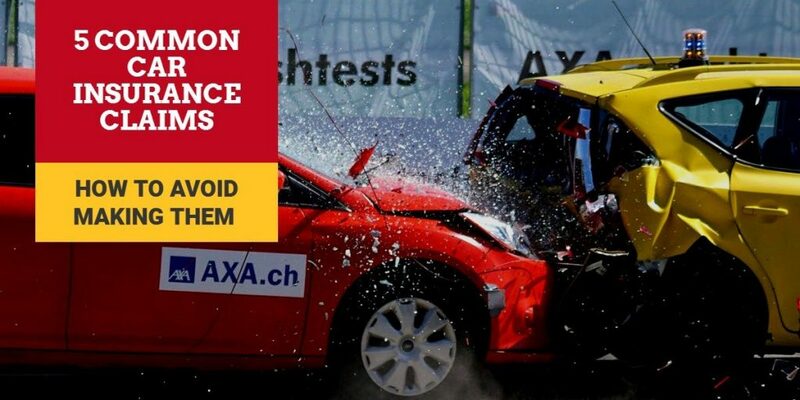 If your car crashes into anything other than another vehicle, this will be considered a single-vehicle collision, and it’s one of the most common reasons people claim on their insurance. Fortunately, there are a number of steps you can take to avoid being involved in this kind of accident. You should always adapt your driving style to the weather, even if your car is the only one on the road. So, if the conditions are less than ideal, keep your speed down so it’s easier to keep control of your vehicle. Additionally, having an empty road in front of you doesn’t mean you can pay any less attention to what’s happening ahead. So, you need to remain vigilant at all times — don’t be tempted to look down at your phone or change the CD that’s playing. Depending on where you live, car vandalism might be an issue you need to consider. The best way to prevent vandals from causing damage to your car is to lock it away in your garage when it isn’t being used. But, if this isn’t an option, there are still some things you can do to prevent it catching the attention of people looking to cause trouble. For example, it’s best to park in a well-lit area, rather than an enclosed alley way. You should never leave valuables — or any items that could catch a thief’s eye — on display in your car. And, of course, you should always lock your car when you’re leaving it unsupervised, even if it’s only for a couple of minutes. To stay safe and help prevent damage from being caused to your vehicle, take these tips on board. You’ll reduce the chance of you having to make an insurance claim, which will help to save you money in the long run.